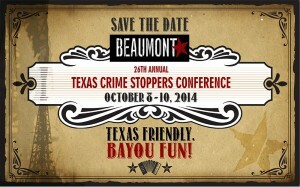 The Texas Crime Stoppers Council’s 26th annual conference is hosted by Beaumont Crime Stoppers. The conference begins at noon on Wednesday, October 8, and ends at noon on Friday, October 10, 2014. 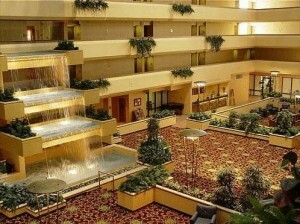 The conference is located at the Holiday Inn Hotel & Suites – Beaumont Plaza. Attendees who arrive on Tuesday evening, October 7th, will have the opportunity for a pre-conference excursion to the L’Auberge Casino & Resort in Lakes Charles, Louisiana. Free bus transportation to and from the Casino will be provided. This year’s conference offers TCOLE and CPE hours and fulfills the training requirement for certification and continued certification. Training topics include: Internet crimes that exploit children, other types of cyber-crimes, metal theft, terrorism, leadership development and other interesting topics concerning the Crime Stoppers initiative. Training also includes a Crime Stoppers Basic Course with the following topics: Texas Crime Stoppers overview, board responsibilities, program operations, record keeping and requirements of the governor’s office for program certification, campus Crime Stoppers, marketing, and legal items & governance. Attendees are responsible for travel and lodging expenses, reservations, and payments. Lodging is no longer available at Holiday Inn & Suites. You can register and pay either online or by mail. Download PDF Registration Form. Payment must accompany registration. You can register and pay either on-line or by mail. Payment must accompany registration. Make checks payable to Beaumont Crime Stoppers. Payment after September 18, 2014 and on-site registration is $250. Confirmation is sent to the email address listed on the registration form. call 409-880-1092 by September 27, 2013. Registration cancellations must be received no later than September 19 in order to receive a full refund. There is a $75 cancellation fee after September 19. Notify Texas Crime Stoppers Training of cancellations or changes by calling 409-880-1092. The Texas Crime Stoppers Council encourages all programs to submit nominations for the annual Texas Best Awards. Programs competing for conference awards may download forms at TheTexasCrimeStoppers.org. Nomination deadline is close of business August 15, 2014. Pre-Conference Casino Trip to L’Auberge Casino Resort in Lake Charles, LA. Free bus transportation provided. 5pm Departure - 11pm Return. Blend of the Bayou Entertainment Night: 6:00 pm at Beaumont Event Centre, 700 Crocket Street. Free shuttle service provided. Event will feature live entertainment, fried fish and gumbo (casual dress).